For those of you who follow me on Twitter, you may have seen a few tweets from me hinting at a vSphere deployment script that I have been working on. This was something I had initially built for my own lab use but I figured it probably could benefit the larger VMware community, especially around testing and evaluational purposes. 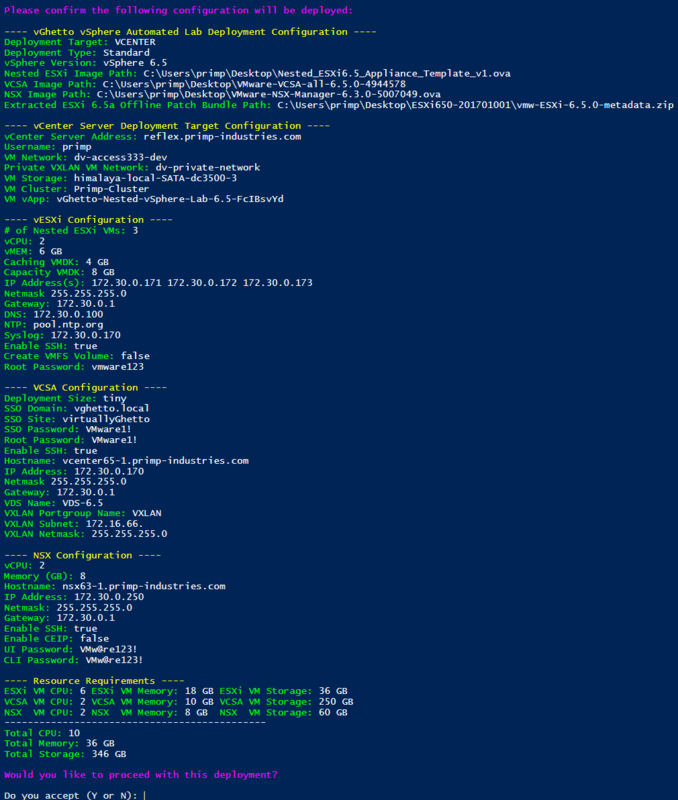 Today, I am please to announce the release of my vGhetto vSphere Lab Deployment (VVLD) scripts which leverages the new PowerCLI 6.5 release which is partly why I needed to wait until it was available before publishing. 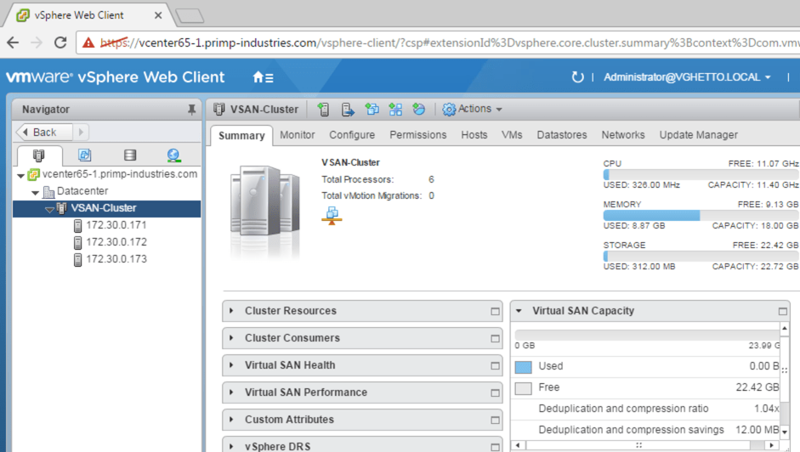 There are literally hundreds if not more ways to build and configure a vSphere lab environment. Over the years, I have noticed that some of these methods can be quite complex simply due to their requirements, or incomplete as they only handle specific portion of the deployment or add additional constraints and complexity because they are composed of several other tools and scripts which can make it hard to manage. 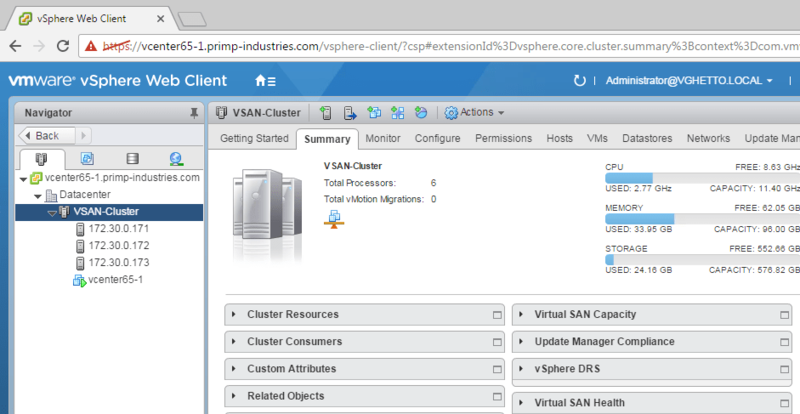 One of my primary goals for the project was to be able to stand up a fully functional vSphere environment, not just deploying a vCenter Server Appliance (VCSA) or a couple of Nested ESXi VMs, but rather the entire vSphere stack and have it fully configured and ready for use. I also wanted to develop the scripts using a single scripting language that was not only easy to use, so that others could enhance or extend it further but also with the broadest support into the various vSphere APIs. Lastly, as a stretch goal, I would love to be able to run this script across the different OS platforms. Below is a quick diagram to help illustrate the two deployment scenarios. The pESXi in gray is what you already have deployed which must be running at least ESXi 6.0 Update 2. The rest of the boxes is what the scripts will deploy. 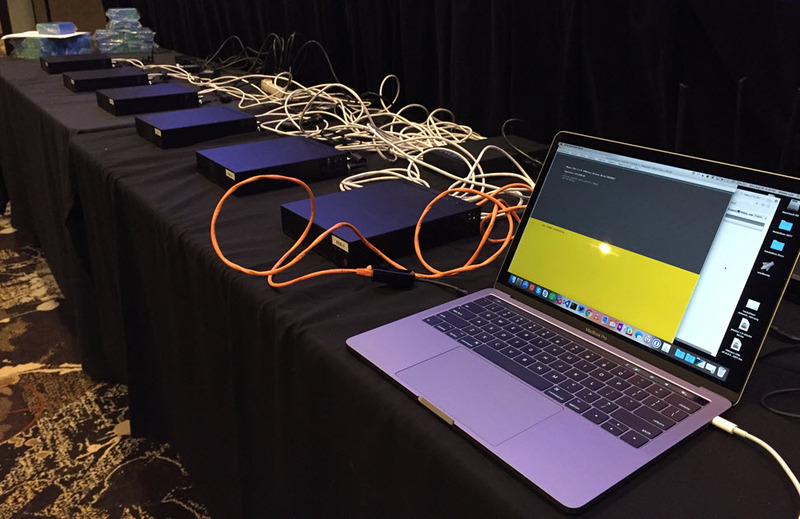 In the "Standard" deployment, three Nested ESXi VMs will be deployed to the pESXi host and configured with vSAN. 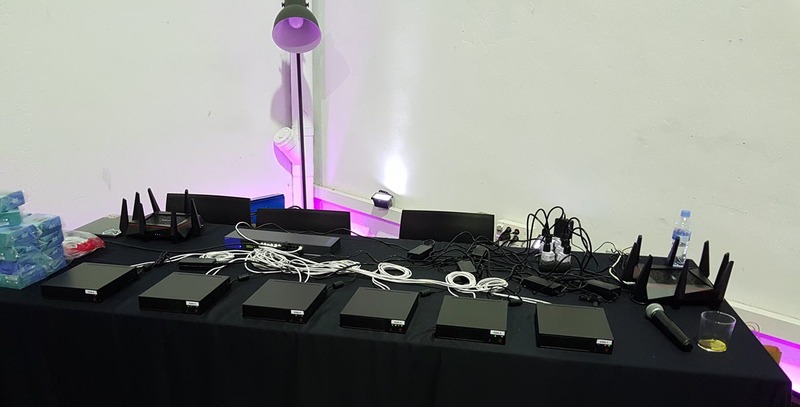 The VCSA will also be deployed directly to the pESXi host and the vCenter Server will be configured to add the three Nested ESXi VMs into its inventory. This is a pretty straight forward and basic deployment, it should not surprise anyone. The "Self Managed" deployment is simliar, however the biggest difference is that rather than the VCSA being deployed directly to the pESXi host like the "Standard" deployment, it will actually be running within the Nested ESXi VM. The way that this deployment scenario works is that we will still deploy three Nested ESXi VM onto the pESXi host, however, the first Nested ESXi VM will be selected as a "Bootstrap" node which we will then construct a single-node vSAN to then deploy the VCSA. Once the vCenter Server is setup, we will then add the remainder Nested ESXi VMs into its inventory. For most users, I expect the "Standard" deployment to be more commonly used but for other advanced workflows such as evaluating the new vCenter Server High Availability feature in vSphere 6.5, you may want to use the "Self Managed" deployment option. Obviously, if you select the latter deployment, the provisioning will take longer as you are now "double nested" and depending on your underlying physical resources, this can take quite a bit more time to deploy as well as consume more physical resources as your Nested ESXi VMs must now be larger to accommodate the VCSA. In both scenarios, there is no reliance on additional shared storage, they will both create a three node vSAN Cluster which of course you can expand by simply editing the script. Obviously, your miles will vary based on your hardware configuration and the size of your deployment. Please refer to the Github project here for detailed instructions. I hope you find these scripts as useful as I do and feel free to enhance these scripts to perform additional functionality or extend them to cover other VMware product deployments such as NSX or vRealize products for example. Enjoy!